The Church welcomes the Pope "with patience and joy"
The Archbishop of Rabat: "Let's get ready to welcome the Pope"
Fés (Agenzia Fides) - Pope Francis will visit Morocco on March 30-31. The Committee of Moroccan Christians has written to Pope Francis two weeks ahead of his visit, asking for the intervention of the Holy See on a theme which is very important to them: religious freedom in the country. The baptized represent only 1.1% of the population (about 380 thousand out of 33.6 million inhabitants, mostly Muslims) and are mostly of evangelical confession. In the open letter, published by the newspaper "Al Massae", some "violations of the religious freedom of Christians" are reported and also accuses Moroccan security forces of "playing an important role in the persecution of Christians by proceeding to make abusive arrests". 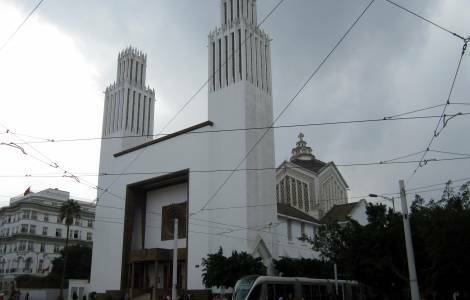 In the text, sent to Agenzia Fides, the Committee says that some Moroccan authorities have "arrested and mistreated people for proclaiming their religion or taking part in prayer services at covert churches, tortured and insulted them and confiscated their identity documents. and even deprived some identity documents for having proclaimed their religion or joined prayers in clandestine churches. In addition, Moroccan authorities also expelled hundreds of foreigners accused of "proselytism". The Committee supports the Moroccan Association for Religious Rights and Freedom, and the Moroccan Association for Human Rights, bodies not officially recognized that, the letter states, "defend religious freedom, register violations and welcome Ahmadis, Shiites, Christians and Ibadis". ASIA/INDIA - Jubilee for the Marian Shrine in Orissa. Christians: "We entrust our suffering to Mary"